It’s illegal to text and drive in the cities of Arlington and Austin, but a bill under consideration by the Legislature would make it illegal in all of Texas. Two North Texas woman testified in favor of the bill in front of the state House Transportation Committee on Tuesday morning. Krista Tankersley of Dallas, said a distracted driver killed her brother last year. "It's so simple to us," she said. "It's so clear-cut when you've lost someone you love so much due to a distracted driver." Her brother, Jeff Tankersley, was killed while riding his bicycle in Amarillo last year. He was training for an Iron Man competition. House Bill 63 would ban all electronic communication while driving. It would include emails, texts and instant messages. Using a GPS would still be legal. Phone calls could still be made with a hands-free device. Texas already bans teen drivers from texting and driving, but Krista Tankersley said teen drivers are not the only ones that need to put down the phone and drive. "It's not a teenage problem," she said. "I live in Dallas, Texas. I drive on the tollway at night going home. It's dark. I can see adults in their cars with their cellphones on. You can see the light from their cellphone, and they’re texting and driving or reading an email. This is not just a teenage problem." 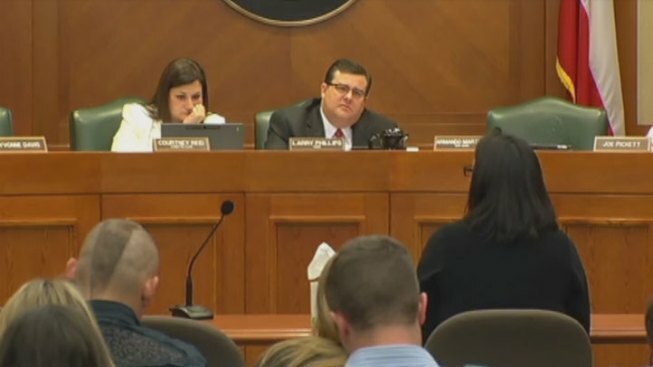 Jennifer Zamora-Jamison also talked to lawmakers in Austin on Tuesday. The Roanoke resident lost her husband, Staff Sgt. Javier Zamora, in 2007. He was 40 years old. He survived a tour of duty in Iraq but was killed stateside in a crash caused by a distracted driver. "My last words to Javier were ironically spoken into a cellphone as they were loading him onto the Lifeflight aircraft," she said. "I told him I love him. I'm on my way. And he died 10 minutes later." Lawmakers passed a similar texting while driving bill last session, but it died on Gov. Rick Perry’s desk. The governor vetoed the bill, calling it "government micromanagement." In a statement, Perry’s office said the governor thinks the key to dissuading drivers from looking at their phones and texting while driving is education and information. "I'm just asking the governor to put a law in effect to advise people, that if you have a cellphone, you have to use it responsibly," she said. "It's just like owning a gun. You don't have laws that say you can't have a gun. You don't have laws that say you can't own a cellphone, you can't have a gun. You have to use them responsibly." Tankersley also had a message for the governor. "I would tell him to put himself in this situation," she said. If he lost his son or his daughter or his wife due to a senseless act of someone finding it more important to look at their cellphone while they're driving a 3,000-pound vehicle ... do you really have a defense? Is there really a good argument about civil liberties?"